She is beautiful, amazing, career-driven, and a great achiever…she is no other than Naomi Watts. Naomi is a multi-talented English actress and producer; best known for her brilliant performances in movies. She made her first film appearance in the 1986 movie titled For Love Alone, since then she has appeared in several blockbuster movies such as Tank Girl, Strange Planet, The Ring, The Impossible, The Glass Castle, Ophelia, just to mention a few. Watts got her breakthrough when she appeared in the 2001 movie titled Mulholland Drive, playing the role of Betty Elms alongside Justin Theroux and Laura Harring. She has received several award nominations including Academy Awards, Golden Globe Awards, and Screen Actors’ Guild Awards, among others. For her beauty, Naomi Watts was listed among People Magazine’s 50 Most Beautiful People in 2002. She has equally served as an ambassador for Joint United Nations Programme on HIV/AIDS. Read on, as we take you through her biography, net worth, career and other interesting facts below. Born Naomi Ellen Watts in Shoreham, Kent, England on September 28, 1968; she was born to English parents Myfanwy Edwards and her husband Peter Watts. Her mother worked as an antique dealer as well as a costume and set designer while her father worked as a road manager and sound engineer for the English rock band called Pink Floyd. She grew up along with her older brother named Ben Watts who is a professional photographer. Naomi attended a Welsh language school when she was young and at the age of 14, her family moved to Australia following the death of her father who died of heroin overdose. While in Australia, Watts attended Mosman High School situated in South Wales and later, transferred to North Sydney Girls High School but never graduated. She enrolled for acting classes during her high school and at the age of 16; she got her first acting gig when she starred in the 1986 movie titled For Love Alone. At 18, she signed up with a modeling agency that sent her to Japan and after failing in several auditions; Naomi returned to Sydney and got hired to do adverts for a departmental store. While she was there, she got the attention of Follow Me Magazine coy which later hired her as an assistant fashion editor. Following her invitation for a drama workshop, Watts resigned from her job as the assistant fashion editor in order to pursue her acting career. After five years of absence from the acting scene, Naomi returned to the movie industry in 1990. She got a minor role in the 1990 movie titled Hey Dad and in 1991; she portrayed Janet Odgers in Stephen Wallace movie titled Flirting. The same year, she appeared in television films titled Brides of Christ, as well as Home and Away. In search of greater opportunities, Watts moved to Los Angeles in the United States in 1992. The following year, she got a minor role in the comedy film titled Matinee. The rest of the nineties, Watts appeared in films such as The Custodian, Gross Misconduct, Tank Girl, A House Divided, Dangerous Beauty, Strange Planet, Under the Lighthouse Dancing, and Babe: Pig in the City, among others. Watts got her breakthrough in 2001 when playing the lead role of Betty Elms in the movie titled Mulholland Drive. Following her brilliant performance, the movie received wide acclaim; thus earning her several awards and award nominations. Subsequently, she starred in other high profile movies including I Love Huckabees, The Ring, King Kong, The Painted Veil, Dream House, The Impossible, Diana, St Vincent, The Glass Castle, and Ophelia. Some of her television series includes The Christmas Wish, Gypsy, Twin Peaks, The Outside, The Wyvern Mystery, and BoJack Horseman. Net Worth: How Much is Naomi Watts Worth? Naomi Watts has been outstanding since the inception of her acting career and has been active in the American entertainment industry since 1986. Interestingly, she is a multi-talented lady; she earns both from her acting as well as her producing career. She also earns from adverts and television commercials. Naomi Watts has made huge wealth for herself and has recorded several awards in her name. She currently has a whopping net worth of $30 million. Shedding a glimpse of light in her personal life, Naomi has been in a few relationships but never made it down the aisle. She started a relationship with an American actor named Heath Ledger in 2002 and after two years; they went their separate ways. They didn’t have any kids from their relationship. 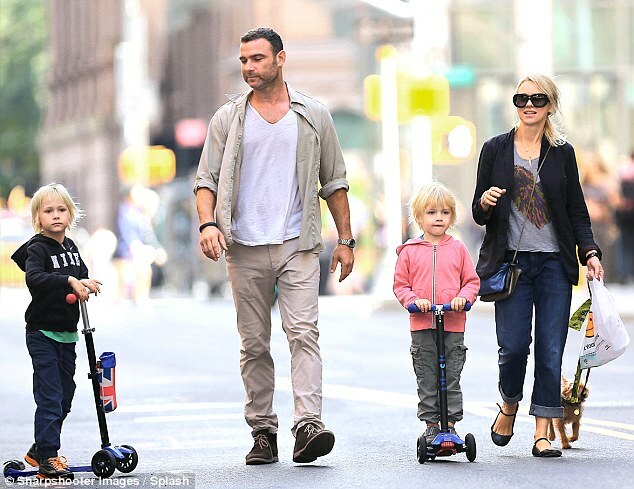 The following year, Watts started dating another actor Liev Schreiber in 2005. Two years later, they welcomed their first child, a son named Alexander Pete in 2007 and in 2008; they welcomed another son named Samuel Kai. However, after eleven years of being together, their relationship turned sour and the couple decided to go their separate ways. They both agreed to have equal custody of their children. Since then, the duo has devoted themselves to being the best parents to their children while exploring their new phase of life. There is no news of Naomi’s subsequent relationships. The amazing actress has a wonderful and attractive personality; she has a great physique and a slim bodybuild. Naomi Watts has a height of 5 feet 5 inches which is the average height for American women. Watts has seductive body measurements (breast-waist-hips) of 34-25-34 inches and weighs 57 kg. In addition, she has blonde hair and blue eyes. She wears a dress of size 2 (US) and a shoe of size 7 (US).